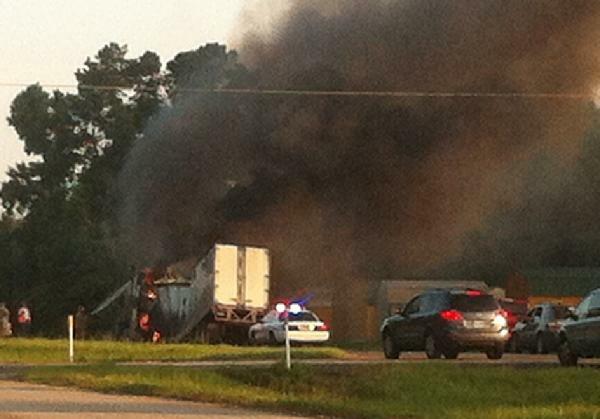 An 18 wheeler hauling zinc burns just inside the south end of the Corrigan City Limits (photo by Johnna Lowe). 18 Wheeler Burns, CORRIGAN, June20, 2013 - At approximately 7:30 pm on June 19, 2013, an 18 wheeler driven by Ronald Browning, 61, of Clarksville, Tennessee, was south-bound on US-59. 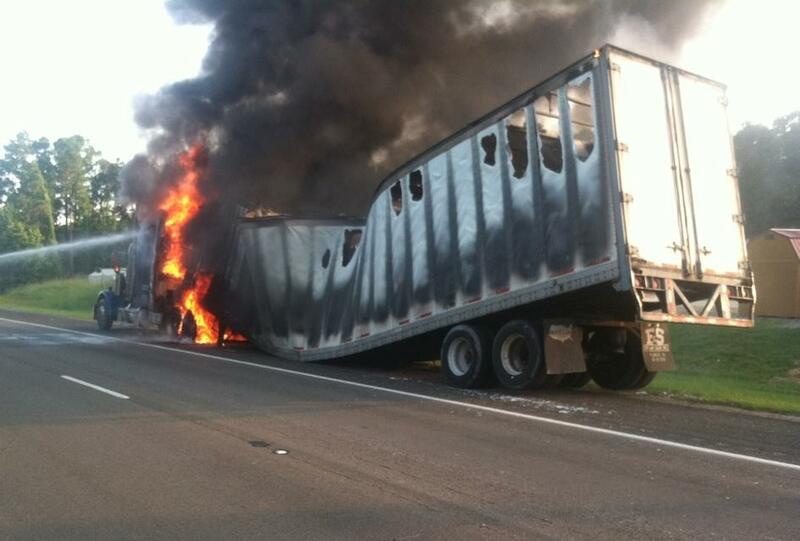 Browning was hauling zinc when he noticed his rig had caught fire. According to Browning, the fire appeared to started at the front end of the trailer. Browning pulled over to the shoulder, grabbed his fire extinguisher and tried with no success to put the fire out. Corrigan Volunteer Fire Department was dispatched to the scene along with Corrigan Police Department, Deputies from the Polk County Sheriff's Office and Trooper Darwon Evans with the Texas Highway Patrol. Firemen extinguished the blaze as the south-bound lanes of 59 were shut down. Traffic was rerouted as south-bound traffic used one lane of the north-bound side to get around the accident. The tractor trailer and it's load were completely totaled. Riley Wrecker Service out of Corrigan was dispatched to clean up the mess. Fortunately, nobody was injured. The scene was cleared sometime after midnight. 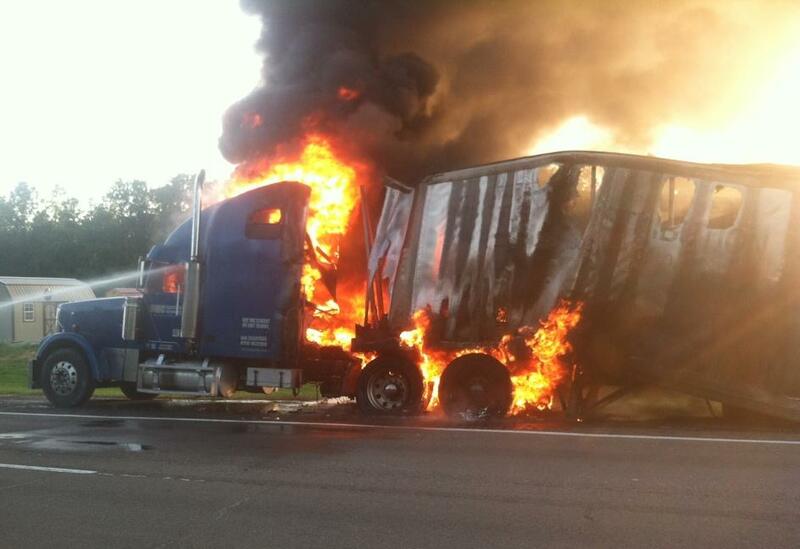 There are many stories involving 18 wheeler accidents reported on this website. 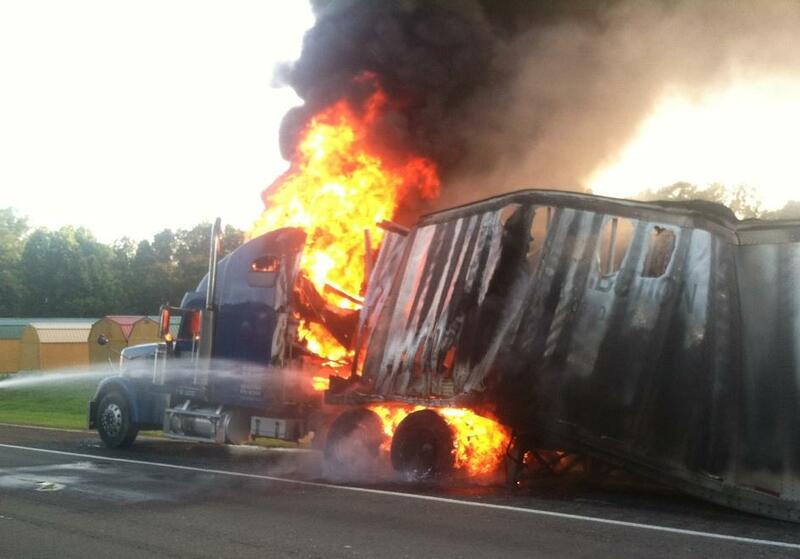 61 year old Ronald Browning of Clarksville, TN escaped safely from the burning truck. Officer James Hight with Corrigan PD assisted Evans in the investigation. Sergeant David Ramsey with the Polk County Sheriff's Office. Trucks from Corrigan Fire Department supply water to put the fire out. A heavy duty wrecker from Riley Wrecker Service was used to separate the tractor from the burned out trailer. James Riley then used heavy equipment to tear down the trailer so that it could be removed in pieces.